Chili served over spaghetti? Yup, it’s the Cincinnati way! 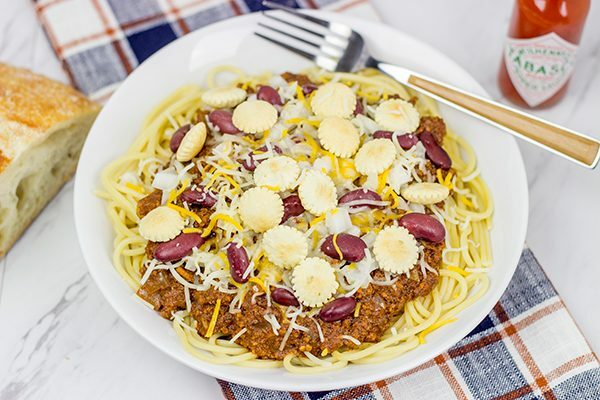 Whip up a batch of this Slow Cooker Cincinnati Chili for dinner tonight! It’s rare that a city gets it’s own recipe. Sure, different parts of the country have their types of food. The Gulf Coast knows how to do Cajun and seafood. 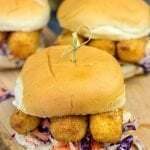 The South does some pretty amazing comfort food. Like buttermilk biscuits. And banana pudding. And pimento cheese. The West Coast has its delicious avocados and limes and rap music. But none of these places have well-known recipes which include the name of a city. Enter Cincinnati Chili. Have you gotten over the thought of adding chocolate and cinnamon to chili? Ok, good. Because now I’m gonna take another left turn and serve that chili over spaghetti. Say what? Is this chili or meat sauce for pasta? Well it’s kinda both! Cincinnati chili is a unique thing, and I’m told that folks in Cincinnati are kinda crazy about it. I first heard about Cincinnati chili in college when a good friend told me about this hometown favorite. Skyline Chili, an iconic Cincinnati restaurant, even cans their version of Cincinnati chili. When she pulled out a can of Skyline, I remember thinking, “ok, canned chili….what’s the big deal?” Well, I soon learned all of the differences between a classic Texas chili (what I’m used to) and the Cincy version. And I gotta say, it’s pretty darned tasty! 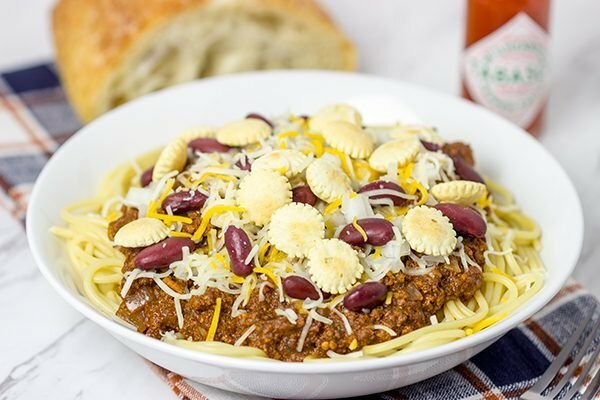 This Slow Cooker Cincinnati Chili is perfect for these chilly Autumn days. 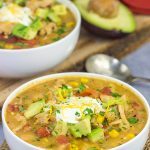 Is there anything better than a slow cooker simmerin’ away on the countertop as the weather begins to turn a bit chilly? Chili…chilly…coincidence? I think not. 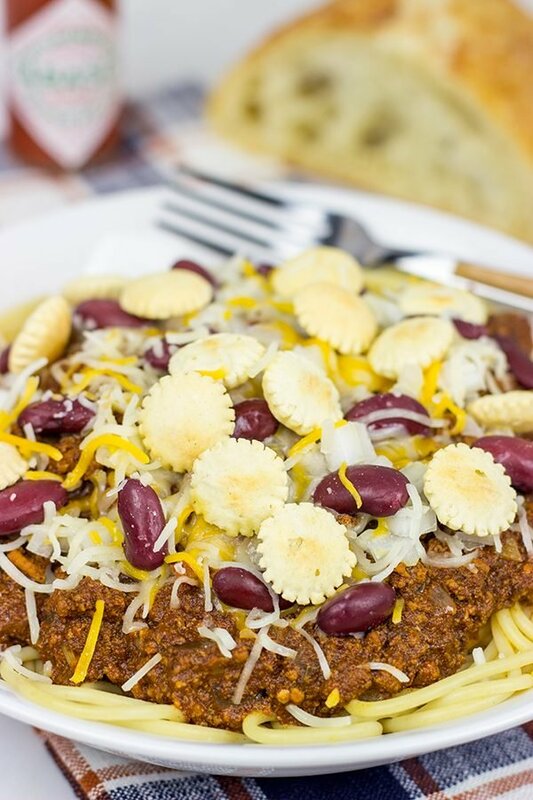 So get out the slow cooker, and get a batch of this Slow Cooker Cincinnati Chili going today! 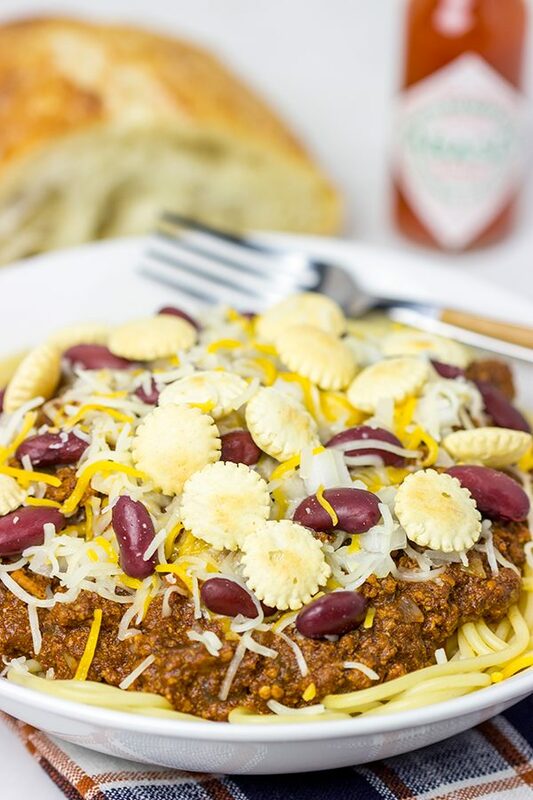 Have you ever had Cincinnati chili? Place the beef and turkey in a crockpot and add enough water to cover beef. Use a whisk to break up ground meat into pea-sized (or smaller) pieces. Once meat is fully cooked, add all remaining ingredients. Stir and cook on low for 4-5 hours. Place pasta on plates and top with chili, onions, kidney beans and cheese. 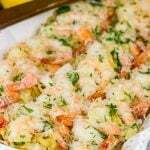 Serve with hot sauce and oyster crackers. This sounds and looks to good to not give it a try!! 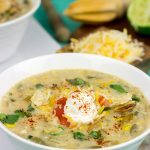 I like the choice of spices and using the crock pot is the best reason to make this now. Thank-you! I am all about the crock pot lately, Ellen! I used to be anti-crock pots, but man those things save a ton of time. I’ve barely put mine away all last week! 🙂 And, yes, give this Cincinnati Chili a try. It’s unique, and I’m not a fan of the chocolate in there…but that’s just me! Thanks so much for commenting, too! I have never heard of this Chili before!! but I have used the cinnamon and the chocolate on savory dishes before. The French use one chocolate square to give red wine sauces that velvety quality! plus adding some depth to the sauce itself. And cinnamon is often use in Tagines and couscous in Morocco. So the Cincinnati folks aren’t that mad after all. Well done David! Dude you are full of left turns today! But those left turns sure are mind blowing to me! Nope I haven’t ever had, or heard of or made Cincinnati chili before! Like I’ve said – I always manage to learn something new when I come visit Spiced! Now I’ve made chili with chocolate and a dark beer before – but not with cinnamon and allspice and cloves! 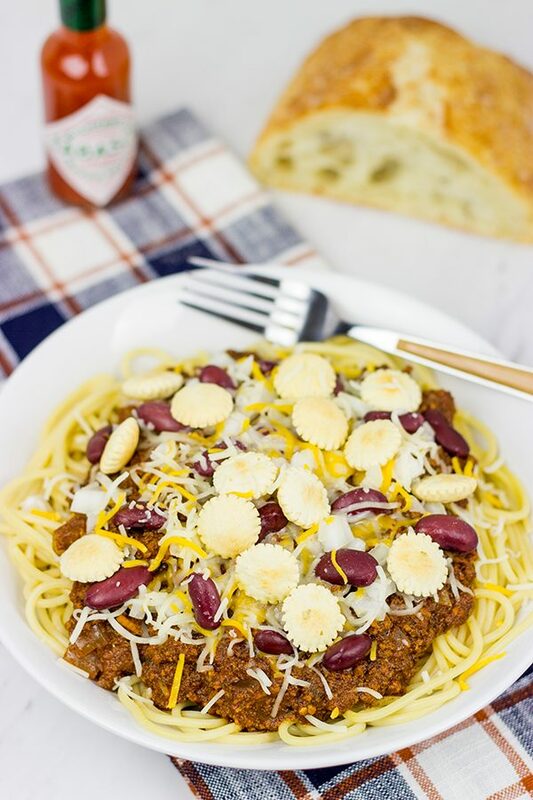 And I’ve definitely never had chili on spaghetti – another recipe idea that am sure Lil Shashi would LOVE! I hope y’all have a wonderful weekend, David! So many left turns that I think we just made a full circle, Shashi! Haha! Hey, that chili with chocolate and dark beer isn’t a far cry from Cincinnati style chili. (Although the ‘official’ Cincinnati chili company denies they use chocolate…but a lot of folks disagree with them. Who knows?) Either way, it’s a fun recipe for sure! Thanks, Shashi! I hope you guys had a great weekend, too! Hi David! Cincinnati chili certainly does have devoted fans! I sure can’t knock serving chili on pasta! We have friends who own a country store/deli and they sell the canned Cincinnati chili. They sell a ton of it, along with cream cheese. 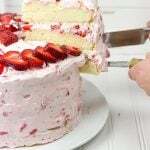 People spread the cream cheese into a shallow dish and top it with the chili for an appetizer. 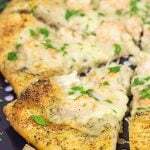 What an interesting appetizer idea! Cincinnati chili on top of cream cheese. I would never have guessed that one! Of course, the pasta alone is strange enough. Either way, this makes one delicious meal for these chilly days! (It is turning chilly down there by now, right??) Thank you! You say slower cooker I scream SET IT AND FORGET IT! Lol I think I watch one too many informercials growing up. 🙂 What? Cinnamon, Cloves, Allspice and Chocolate, in chill? Now you have my attention, it sounds like a mole recipe. I’m all for serving chili over pasta, eating it like meat sauce sounds like a delicious idea. I wish I had smell-o-vision because this looks tasty. Haha! I can totally picture you screaming “Set it and Forget it” at the computer screen, Mary! 🙂 I’ve become a huge fan of my slow cooker lately, so watch out…there might be more screaming for you this winter! You’re totally right. 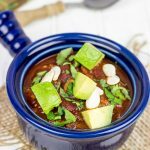 This chili is like a cross between regular chili and mole. Very interesting, but very tasty, too! Thank you, my friend! Cincinnati chili is a really unique dish…but man, they love this stuff in Cincinnati! I gotta admit that it’s pretty darned tasty, though. Personally, I’m not a huge fan of the chocolate in there…but I think that’s just my own tastes. The cinnamon + clove is a fun twist on chili. So feed that stomach some chili and tell it to quit whining, ok? Haha! Thanks, Kevin! I’ve heard of each of those things – cinnamon, chocolate, pasta – in chili, but not all at the same time. I’m not a chili purist. Maybe that’s because I’m a Midwesterner. I’ve never heard of Cincinnati chili, though … it sounds really good! Yum, sounds so good! I’ve never tried “Cincinnati” Chili, sounds like I need to do that ASAP! I just read about eating chili over pasta on another blog just a bit ago. I think that it sounds like something I would enjoy. Not sure about the chocolate, but I would love to try it. Your chili does look delicious! You know, I’ve had cayenne in chocolate and kinda liked it. This one is a little different as it’s just a touch of chocolate in the chili…but it worked! I still think I prefer it sans chocolate, but that’s me. Too bad it’s getting hot down there in your part of the world…save this one for next July! Hah!